It is safe to say that more people are concerned about a cleaner environment than a few decades ago. The United States Environmental Protection Agency (EPA) published a report in 2015 that demonstrated Greenhouse Gases Emission sources. Many industry players were hugely concerned to note that electricity production does the most damage, accounting for 29% of emissions. What strikes your mind at the mention of carbon footprint? An exciting technological project? A collection of futuristic ideas? ARANER thinks differently. The term Carbon Footprint becomes clearer when you analyze the two words “Carbon” and “Footprint”. Carbon refers to a wide range of greenhouse gases synonymous with global warming. Footprint on the other hand is a general reference to total impact produced by something. From this, we can decipher that Carbon Footprint refers to an estimate of the full impact of something on climate change. We find this definition by Cambridge Dictionary simple and to the point: Someone’s carbon footprint is a measurement of the amount of carbon dioxide that their activities produce. 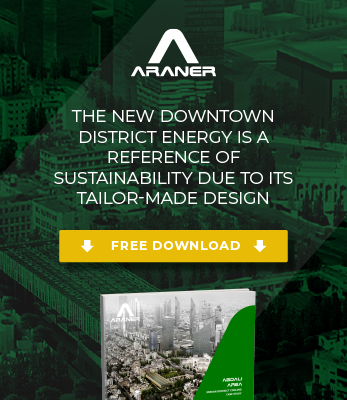 ARANER is constantly searching for opportunities to reduce the carbon footprint. It aligns its activities to various global environmental conservation efforts. Solutions for the power industry comply with strict emission limits, providing all the emission data as required. Competition between coal and natural gas sources is still tight, with the U.S. Energy Information Administration predicting that natural gas will remain the primary energy source for generation in 2018. It will average at 33% in 2018 compared to 30% for coal. As demand for power to drive the global economy increases, we can only expect use of these sources to follow suit. While the U.S. Energy Information Administration had predicted a reduction in energy-related CO2 emissions some years back, they expect an increase in this pollution in 2018. No wonder many efforts are geared towards lessening the amount of carbon dioxide produced during power generation. Turbine Inlet Air Cooling (TIAC) has had a tremendous effect in the electricity generation sector, specifically in gas turbines. While the main purpose of the technology is to augment power, it does reduce carbon footprint. TIAC reduces the amount of fuel used by the power plant, consequently reducing the amount of GHGs and pollutants released to the atmosphere. The most ill-famed GHGs are carbon dioxide, methane and surface level ozone. Compared to a new turbine, TIAC technology is able to match a turbine’s power output, while offering higher fuel efficiency and lower installation cost. Its contribution towards lower carbon emission is renowned around the globe. A good example is the United Nations Framework Convention on Climate Change (UNFCC) report, which highlighted the success of the Jebel Ali Combined Cycle Power Plant (Dubai). This facility featured lower fuel consumption and higher efficiency leading to reductions in CO2 emissions, as monitored from January 2013 to December 2014. It exhibited an impressive 5.54 % reduction in emissions upon installation of TIAC components. To be specific, the project managed to reduce carbon dioxide emissions by 65,799 tons (would you believe it!). Turbine Inlet Air Cooling plays the important role of augmenting the power output of a CT at high ambient temperatures. The technology is especially suitable for warm/hot climates where elevated air conditioning needs coincide with lowered turbine output. ARANER’s mechanical chillers are characterized by a heat transfer system that features a chilled fluid (mostly water) directed to a heat exchanger to cool gas turbine inlet air. TIAC can also be combined with thermal energy storage (TES). Thermal energy storage is a technology that allows facilities to shift the power for the chillers to off-peak hours when the power is at the lowest value and least in demand. This means that more power will be available during on-peak hours, leading to better financial performance for the facility. When TIAC and TES combine, the system is referred to as TESTIAC. ARANER boasts of over two decades experience offering TIAC solutions to facilities across the globe. As you have seen from the mentioned case study, clients are enjoying the results of the company’s installations. The team is able to install all types of TIAC systems. The facility owner gets manifold benefits, starting with reduced fuel consumption and crowned by reduced carbon footprint. When choosing the exact system to install to reduce carbon footprint in your facility, it is necessary to analyze climatic conditions, budget limitations, project economics and desired power output. No simple answer exists; sometimes a combination of several solutions is the best, as we have seen in the case of TESTIAC. For more on controlling pollution from the industry, meet our experts.